‘A Moscow news agency said the regional council voted to issue a declaration restoring the Crimea’s “statehood” and also to hold a vote to determine the future of the attractive peninsula on the shores of the Black Sea. 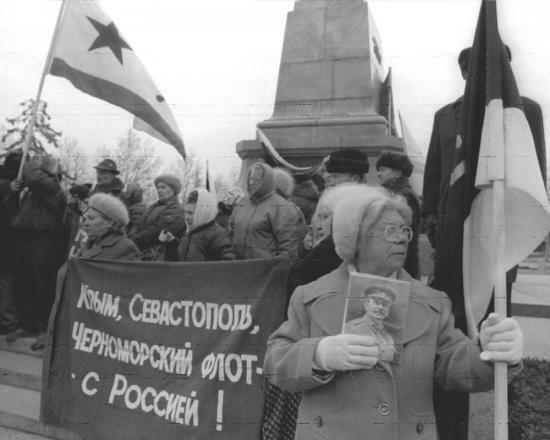 What it shows is that the issue of Crimea’s relations with Ukraine (and of the Donbass region around Donetsk) was a live and troublesome matter even before the break-up of the USSR at the end of 1991. And it also shows that at one stage the recently-established Ukrainian government in Kiev acted with considerable ruthlessness to prevent a referendum in Crimea on independence, a referendum which had been requested by 246,000 of the peninsula’s 2.5 million people. I’ll come to the details of this forgotten scandal later. On 21st January, Dow Jones reported an overwhelming vote (93% of an 80% turnout) for Crimean autonomy – that is, separating the peninsula from the direct authority of Ukraine. This, of course was before Ukraine had declared its own independence. 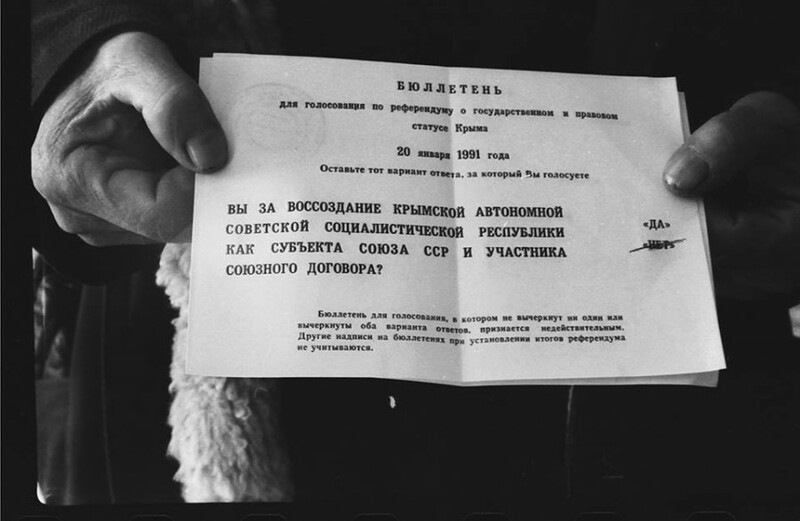 Russians in Crimea had long resented Krushchev’s 1954 transfer of their region to Ukraine from Russia. A statement issued in Russian President Boris Yeltsin’s name said the Russian Federation reserved the right to review its borders with any adjacent republic which left the Union. Instantly, Ukraine’s President Leonid Kravchuk reacted. Reuters reported the following day ‘Kravchuk said on Tuesday Soviet republics were concerned by Russia’s warning that it would not allow those with large Russian populations to secede. Reuters reported :’PARIS, Aug 28, Reuter – Russian President Boris Yeltsin said on Wednesday Russia would respect the frontiers of republics that decided to sign the Union treaty. “As for republics that stay in the (Soviet) Union, we will of course respect their frontiers, the Union treaty caters for frontiers to be respected,” he said in an interview with French radio. 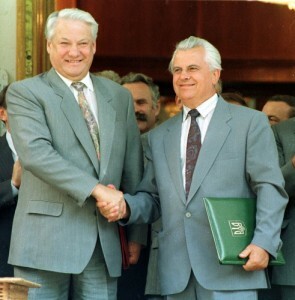 Yeltsin added that a joint Soviet-Russian delegation which flew to Kiev on Wednesday (Aug 28, 1991 – OR) would tell Ukrainians that Russia would have no territorial claims on their republic if the Ukraine decided to stay in the Union. The Ukraine’s parliament declared independence from Moscow on Saturday (Aug 24, 1991 – OR) subject to confirmation by a referendum in December. The Soviet-Russian delegation’s mission is to try to defuse Ukrainian alarm over Yeltsin’s announcement on Monday (Aug 26, 1991 – OR) that Russia reserved the right to contest borders with any republic that quit the Soviet Union. His statement stirred historic suspicions of “Russian chauvinism” in the Ukraine, which contains two areas — the Donbass and the Crimea — populated mostly by Russians. “Relations with Russia are becoming more and more complex as a result of Yeltsin’s statement,” an official in the Ukrainian administration earlier commented. In the radio interview Yeltsin said questions of territory, frontiers, frontier security and diplomatic relations would all have to be settled by negotiation and “without shedding blood. ‘MOSCOW (AP) – The Soviet legislature, backing Mikhail Gorbachev’s bid to stem the collapse of central authority, voted today to send a delegation to the Ukraine to discourage the breadbasket republic’s secessionist drive. ’ SIMFEROPOL, U.S.S.R. (AP) The Crimean parliament laid the groundwork for secession from the Ukraine when lawmakers approved a measure enabling the region to hold a referendum on its political future. On Friday, lawmakers also sent a message to the Ukrainian parliament, asking it to continue to participate in Soviet President Mikhail Gorbachev’s plan to hold the Soviet Union together as a loose federation. On March 17, voters in the Crimea gave 87.3 percent approval to Gorbachev’s federation plan. Ethnic Russians comprise 67 percent of the Crimea’s population. Many of them worry that the Ukraine might try to exert more control on the region after the Ukraine’s presidential election and referendum on independence, set for Dec. 1. 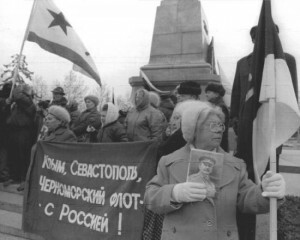 ‘SIMFEROPOL, Soviet Union, Nov 27, Reuter – Angry and frightened Russians in the Crimea are vowing resistance to the idea of their fertile sunny peninsula becoming part of an independent Ukraine. “I don’t want to find myself living in a foreign country,” shouted 67-year-old war veteran Georgy Malyshev, one of hundreds of Russians who demonstrated here last week outside the Crimean parliament. ‘CRIMEA, Ukraine — When empires start disintegrating, at what point do they stop? Ukraine has now firmly established itself as an independent state, but within Ukraine, there is the Crimea. While a surprising number of people here say they had never thought about the question of their own independence — being an autonomous republic within a vast empire was enough — they are now saying that with the Soviet machine having broken down, the Crimean people now want a shot at their sovereignty. 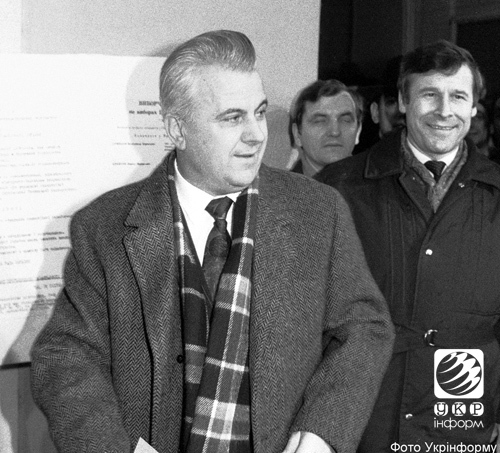 Leonid Kravchuk voting at All-Ukrainian referendum on independence on Dec 1, 1991. ‘In no uncertain terms, he told the legislators they were not ready for independence — the Crimea had neither a constitution nor other important laws in place that would guarantee success as a separate nation. Mr. Kravchuk drew applause, however, when he promised that under an independent Ukraine, the Crimea would maintain its current autonomous status, including a guarantee that all languages and cultures on that territory would be respected. ‘He noted Ukraine was ready to work with the Crimean parliament and people to build one unified country — Ukraine. [Kravchuk] If people are collecting signatures in order to determine their political situation in their region, I do not see anything unusual in it. Whether or not it is necessary to do that at present is another thing, in my opinion, since the referendum has already taken place and this peninsula has expressed its attitude both during the referendum on 1st December and during the other referendum [all-union referendum] and in a great number of resolutions of the supreme soviet of the Crimean republic – well, that is another matter. ‘Russians have gathered nearly 250,000 signatures, enough to force a referendum on Crimea’s status. Such a vote would likely increase friction between Ukraine and Russia. “Ukrainians are nationalists,” said Alexander Tsitov, a Russian who works in a cooperative in Simferopol, the capital. “They want to introduce their language, and that is no good for us. They want us to be their colony. ‘SIMFEROPOL, Ukraine, May 5 (AFP) – The parliament of Crimea Tuesday voted for secession from Ukraine, subject to confirmation by a referendum to be held soon. ‘SIMFEROPOL, Ukraine, May 5, Reuter – The Crimean peninsula passed a declaration of independence from Ukraine on Tuesday, a move likely to inflame relations between Kiev and Moscow. Deputies in the Crimean parliament in Simferopol stood and applauded loudly after passing an “Act of Independence” by 118 votes to 28. The decision must be confirmed by a referendum. SIMFEROPOL, Ukraine, May 6, Reuter – The Crimean parliament on Wednesday appeared to reverse the previous day’s declaration of independence by changing its constitution to say the peninsula formed part of Ukraine. “The republic of Crimea is part of the state of Ukraine and determines its own relations with Ukraine on the basis of treaties and agreements,” the amendment said. Tuesday’s vote was a reaction to a Ukrainian parliamentary resolution giving the Crimea a measure of independence which the local parliament said fell short of its demands. ‘”But I would have to say that the voting in the parliament of Crimea is not the last instance,” he said during a ceremony marking the opening of Ukraine’s embassy in the United States. “We can say one thing for sure that what has been voted in the parliament of Crimea is against the constitution of Ukraine,” Kravchuk added. ‘KIEV, May 8, Reuter – A campaign by the Crimean peninsula to break away from Ukraine could plunge the region into a conflict similar to that in Northern Ireland, a top aide to Ukrainian President Leonid Kravchuk has said. Alexander Yemets, Kravchuk’s top adviser on legal issues, also said in an interview on Thursday that Ukraine would never give up the peninsula, populated mainly by ethnic Russians but given to Ukraine as a “gift” by Russia in 1954. Speaking a week before a summit of leaders of the Commonwealth of Independent States, he accused prominent Russian leaders of stirring up confrontation in the run-up to Tuesday’s declaration of independence by the Crimean parliament. “The problem is difficult and complex and could take on a violent character,” Yemets told Reuters in his office, once part of the headquarters of the now-banned Communist Party. On 13th May, we learned from AFP: ‘The Ukrainian parliament on Wednesday declared unconstitutional a recent declaration of independence by the Crimean peninsula, where the former Soviet Union’s huge Black Sea fleet is based. The parliament called on the local authorities in the peninsula, which was ceded to Ukraine by Russia in 1954, to “return to legality” by rescinding the declaration of independence they issued on May 6. And on 14th May 1992, the London Times reported : ‘Ukraine’s parliament yesterday moved to bury the Crimea’s growing Russian separatist movement by issuing a five-point plan over-riding the peninsula’s independence vote and threatening direct presidential rule. On 30th June, we learned from Reuters; ‘KIEV, June 30, Reuter – Ukraine’s parliament on Tuesday granted the Crimean peninsula wide-ranging autonomy, allowing it to determine its own foreign economic relations and social and cultural policies. The power-sharing arrangements were detailed in amendments to a new law aimed at satisfying the territory’s aspirations for self-rule while keeping it under Kiev’s jurisdiction. And on the 9th July 1992, Reuters said: MOSCOW, July 9, Reuter – The Crimean parliament voted on Thursday to suspend plans for a referendum on independence from Ukraine, local journalists in the regional capital Simferopol said. 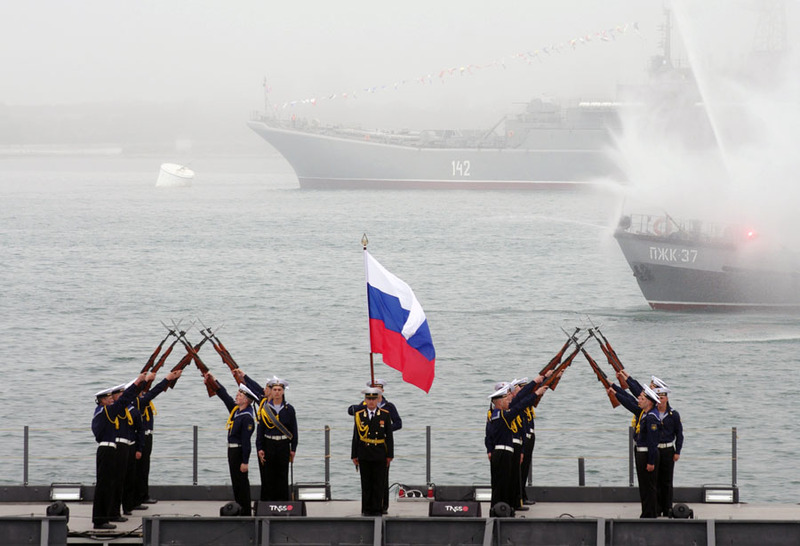 Russian Black Sea Fleet celebrating its 230th anniversary in yet Ukrainian Crimea, May 2013. But it hadn’t really gone away. In summer 1993, BBC monitoring noted :’ A regular congress of the Crimean Electors’ Movement was held today [29th May] under the slogan “Away with independence! Give us a referendum!”. The movement is made up of adherents of joining the peninsula to Russia. Several resolutions were adopted at the congress, and on the situation in the Black Sea Fleet too. Those present called on the presidents of Ukraine and Russia to hold their meeting on problems of the Black Sea Fleet only in Sevastopol, and to adopt at the meeting an unequivocal decision – on the impossibility of dividing the fleet, and on preserving Sevastopol’s status of Russian Federation naval base. 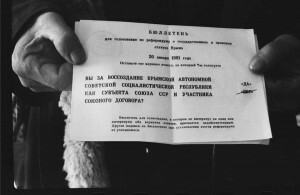 In the event that this demand is not fulfilled, says the resolution, the participants of the movement reserve the right, following the sailors’s example, to hang Russian flags on their buildings.